De academische reflecties op hedendaagse politieke en sociale transities en revoluties zijn in de maak, zo ook de feministische analyses. Een voorbeeld is het bekende tijdschrift Feminist Review, dat een oproep voor artikels heeft verspreid voor een aankomend themanummer getiteld 'Revolutions'. Het themanummer wil specifiek de vraag stellen naar revoluties en gender. Interessant daarbij is dat de gastredacteuren het concept revolutie zelf ook aan analyse willen onderwerpen: wat verstaan we onder 'revolutie', en hoe stelt dit ons in staat om bepaalde gebeurtenissen al dan niet in kaart te brengen, te analyseren en te begrijpen? Hoe kunnen we revoluties en transformaties op het vlak van gender verhoudingen leren begrijpen op het relationeel vlak - in termen van fantasieen, verlangens, strategieen en praktijken? 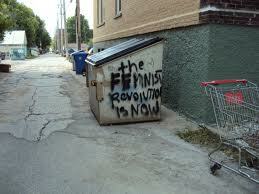 Revolution: call for articles and open space pieces for Feminist Review, special issue, no. 106, February 2014. "Revolutions as a deliberately open special issue title references revolution as a phenomenon, social movement or form of transformation both contemporarily and historically. The editors are particularly interested in highlighting the difference it makes to the theory or practice of revolution to consider gender, or to gender to consider ‘revolution’. We want to ask not so much ‘what about the women?’ (although this remains an important question), but ‘what kind of revolution can or cannot attend to gender relations?’ The title also references changes that might be made in the world that might not usually be thought of as revolutionary, and our plural form revolutions stresses both different forms (including counterrevolution) and the effects of and contests within revolutionary practices. Where does activism end and revolution begin? How might that distinction itself be gendered? In this special issue, we hope to explore the gendered nature of revolutions of a variety of kinds, some but not all of which might also be called feminist, and to situate the question of revolutions in historical and cultural context, making it a question rather than a presumption: revolutions? Revolutions as a term has a further openness that may not reference recent or past social movements, even where contested. It may refer to the transformation or return (in altered form) of ideas, to the phrase that ‘what goes around comes around’. In this sense our pluralisation resists an easy periodisation of revolution as well as the assumption that we already know what a revolution is when we see one, what makes a revolution gendered or feminist, or who its proper subject is. Revolution is always a relationship, always one with actors who exchange fantasies and desires as well as strategies and practices."